Mix together your crust ingredients (graham crackers, sugar and butter) and press into the bottom and up the sides of a 9" springform pan and then set in refrigerator. In bowl of a stand mixer add your cream cheese and beat until smooth and lumps are gone then add in your sugar slowly until combined. Next add in your eggs one at a time, mixing well after each addition. This ensures that they are fully incorporated evenly. Then add in your vanilla extract and sour cream just mixing until combined. 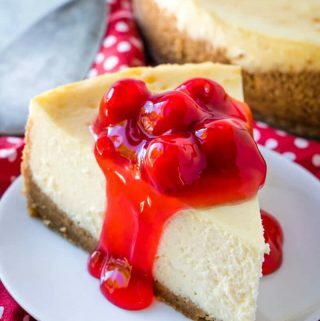 Pour into your prepared crust and wrap pan in heavy duty tin-foil and place in large roasting dish and fill dish about half way up your springform pan with hot water (the water bath helps the cheesecake from not cracking). Reduce oven heat to 300 and bake for 1 hour and 30 minutes then turn off heat and leave in oven for another hour until center is set. Remove from oven and place on counter to cool to room temperature and then refrigerate for an additional 8 hours. Top with favorite topping if desired.